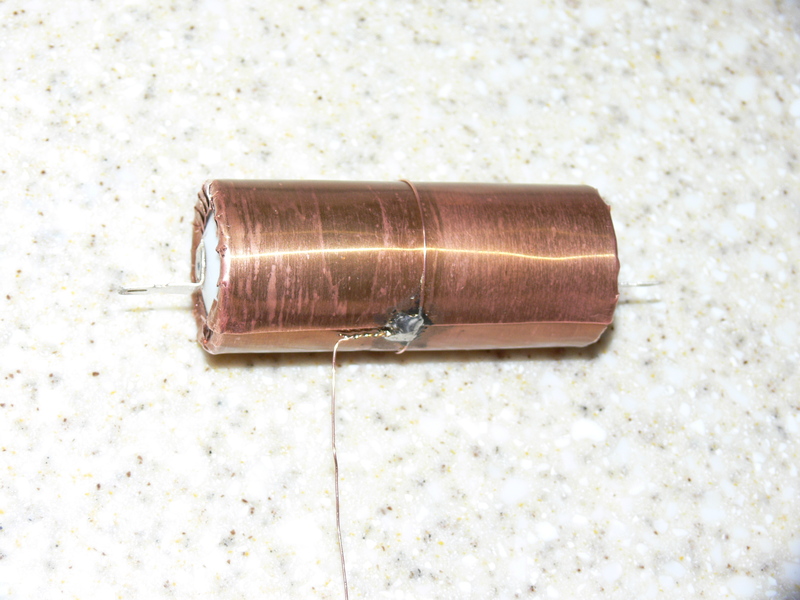 How often do you wonder about the number of legs of a capacitor ? Why is it always two, and not three ? Three – is a beautiful number. So why don’t we make three legged capacitors ? Well … hmmm … some of us DO make them with three legs. Like me. Let me show you a picture of a cap on three legs … My own production. Have a look at it and tell me, why on earth did I make it. Yes. I made it, because I needed it. Because it was NECESSARY. On three legs. 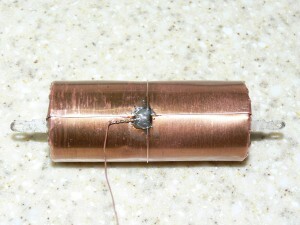 So here are the photos of a Teflon type FT-3 capacitor, 0,22uF / 600V. I needed to put a three-legged cap like this into my amp. My question to you is as follows: WHY was it necessary to do so ? My hint is: YES, it DID bring a major, significant improvement. There ARE certain places, in certain circuits, where such a solution is simply unavoidable. Oh, and YES, I am aware of the fact that a foil capacitor, especially one of high quality, has it’s outer foil marked with appropriate markings on it’s body. That it actually has it’s “MINUS” electrode, just to use this colorful analogy to the electrolytic type capacitors. 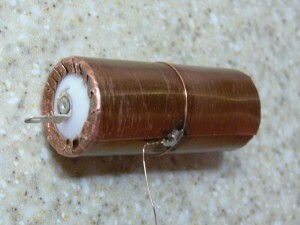 Foil capacitors are not fully symmetrical, as it may seem on first glance. Their connectors are not freely interchangeable between each other. There is a difference between them, of which I am perfectly aware of. The “Outer Electrode” you say. That it need be connected to that particular “side” of the circuit, which exhibits a lower dynamic impedance to AC ground. I know all that, and I am happy that you know this too. Nonetheless, I repeat my riddle: WHEN do we NEED to USE a three legged capacitor ? … OK … here comes the solution of the riddle is as follows. Imagine, that you have a very good tube buffer topology, which is an overall very good performer, but has only one major drawback: it is “difficult” in terms of output impedance. The circuit I am referring to is the SRPP (Shunt Regulated Push-Pull) topology. It is, most probably, one of the most popular broad-band stages, but at the same time, one that is the least understood. Here I will only hint to a very good source on the subject: www.tubecad.com ( … Mr. Broskie, a thousand thanks from my side for all the good stuff you write about in terms of tube theory, but also silicon circuit theory. Great Stuff ! … ). Specifically, read some of the articles (quite a few, actually) that John wrote about the SRPP circuit. To make a long story short, SRPP is a darling in terms of performance, but it has “issues” with the impedance of the next stage, as it is a fairly complex “play” between the two circuits, that takes place. It is NOT possible to understand the SRPP with no load connected. Without the load, SRPP becomes .. something else. For simplicities sake, lets just trivialize and say that SRPP is a “high output impedance circuit” (which is a close, albeit faulty, approximation of what is really going on there). It IS possible to understand SRPP, if you a). short circuit the output and see what then happens, or b). think about what the optimum load for this circuit is. Yes, there IS an optimum value of the load. But if your load is lower than the optimum, then bizarre things start to happen. Let’s just say that SRPP performs best with “low Ra” tubes, i.e. tubes with a fairly low internal dynamic impedance as seen from the anode. So now comes the dilemma: you build your SRPP with a “good sounding” tube, but with a high “Ra”. As a result, you essentially have built a buffer stage with a high output impedance. Now, guess what … My amplifier, which needs to be fed with the signal from such a stage, is also a tube amplifier, and it also exhibits a high value of input impedance. A high output impedance as seen at the output from the SRPP. A high input impedance as seen at the input of the following tube amplifier. Prior to that, a lengthy run of DIY interconnect cable (pure silver, solid core, in Teflon tubing, twisted paired, with screening). So you apply a signal capacitor to “take” the signal from the high impedance anode and forward it to the high impedance input of your tube amplifier. The result: HUMMMMMMMMMMMM …. Lots of Hum. Very annoying. The simple reason being is that now there Is no “low impedance” side of the capacitor. BOTH sides are of a high impedance. There IS no low impedance side, to which you can turn your capacitor, with its “outer electrode”, as you would normally do, so as to minimize the amount of external noise being picked up by your foil capacitor. 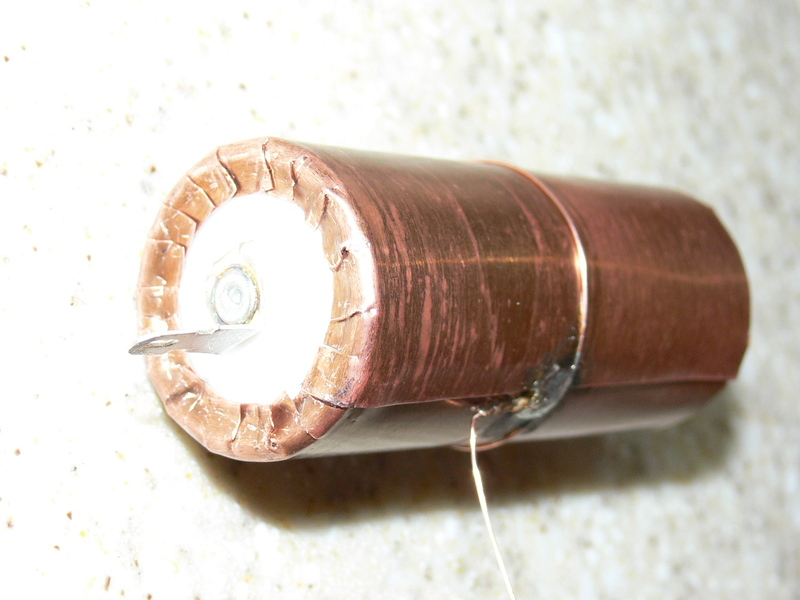 A capacitor with two connectors – does NOT solve the problem, no matter “which way” you connect it, with the outer electrode towards the SRPP, or with the outer sleeve towards that lengthy interconnect. As I did not want to abandon the choice of my most favored tubes for this particular application, and I did want to get rid of the hum, I needed to come up with an idea so as to solve the problem. The solution is Screening. Ok. It is easy to screen the internal wiring in the SRPP buffer stage (did not help). It is easy to triple check the quality of the screen of the interconnect (did not help). It is easy to apply screening within the internals of the tube amp (did it a long long time ago). So the only missing part that remains unscreened is the capacitor itself. I applied a thin copper foil, of 0,1mm thickness (the ones that you can get in hobby stores, with accessories for people that build models of planes, cars, ships, etc). Applied it as an outer screen coating. Added an earthing wire to it. The “hum” problem totally disappeared. The buffer is successfully conveying music ever since. There is but one significant drawback to the method I describe here. It is the issue of us introducing a parasitic capacitance to ground. Not big, but it is there. In the case of the circuit that I used the thee legged capacitor, this weakness actually turned out to be a non-issue. The parasitic capacitance simply started serving a different purpose, which is filtering out the very high frequency noise, that comes out of the DAC – the one that you filter out anyway, by means of a low-pass filter which is normally installed at the output of the DAC chip. Such a filter is trimmed at about 160 kHz, so it is fairly far away from the audio band. To deal with the matter of parasitic capacitance – I simply threw out the shunt capacitors to ground that were installed on the board of my DAC, and allowed the parasitic capacitance of the 3-leg cap to do the filtering instead. Another benefit of such an approach is that now we “separate” the shunt capacitance from the output chip, as it is in the anode (i.e. Output) section of our tube buffer. Therefore, we do NOT unnecessarily load the output of the DAC chip with a capacitance ( = frequency dependent impedance) to ground. This should actually result with a lower level of overall distortion.